On Tuesday September 11, 2001, at approximately 0847 HRS, Manhattan ERS Box 8087 was transmitted for a report of an aircraft into the World Trade Center, building 1. Within seconds, a 3rd Alarm was transmitted on arrival for a confirmed commercial aircraft accident. Only a short moments later, 4th and 5th alarms were transmitted for Box 8087. As the 1st through 5th alarm companies began to arrive and assume there tasks, 15 minutes after the 1st crash, a 2nd aircraft crashes into Tower 2 of the World Trade Center complex sending a fireball towards the morning sky and showering twisted metal, shards of glass and other debris on the emergency workers below. A 5th alarm was then transmitted for Tower 2 and climbed to what was equivalent to 30 Alarms with a massive mutual aid response from surrounding City's and Counties. At 1000 HRS, WTC Tower 2 collapses. Only 30 minutes later, Tower 1 follows. There are reported hundreds of missing civilians and rescue workers. Squad Company 41 responded from the Bronx to the WTC incident. 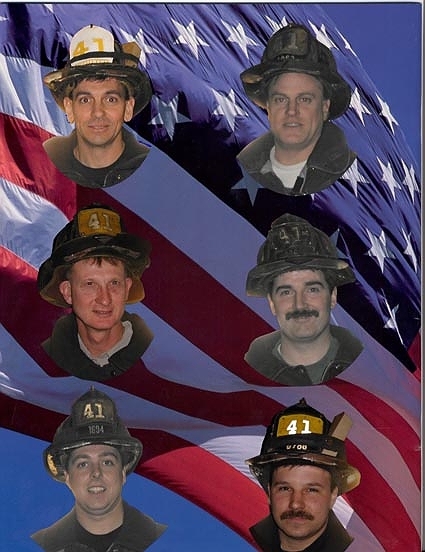 Lt. Mike Healy and Firefighters Bobby Hamilton, Bruce VanHine, Tommy Cullen, Mike Lyons, and Greg Sikorsky were riding on this date. These brave members never returned. Firefighters Tommy Foley and Donald Reagan of Rescue 3 who are former Squad 41 members also made the supreme sacrifice.